Set - 11pcs. 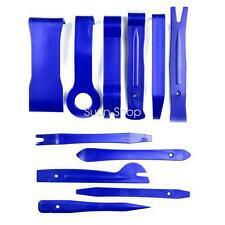 Great for automotive snap on trim panel and molding removal. Easily and safely to remove radio panel, trim, molding, door panels, and dashboards. Specially designed tools make easy work of removing and installing specialty fasteners used in auto interior panels, trim, molding and emblems. Depth of Cup: 3.15 ". We have warehouses in the USA, CA, and AU. 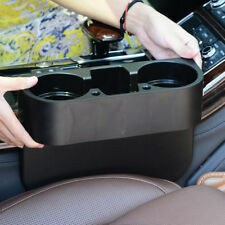 1 x Universal Car auto Double Din Radio Pocket Drink Cup Holder Storage Box. Function: Drink-Cup Holder Storage Box. Put debris drinks! Material: high-quality plastic. Product Model: CX-28 ( double layer). Black PU Leather Catch Catcher Box Caddy Car Seat Gap Slit Pocket Storage Organizer 2pcs. Easy to Install - Just insert the gap storage box the seat and console, available for a bigger gap Place phone, card, coin, money, key, cup and so on. Creative car cup mat with decorative RGB LED, makes your car cup holder looks cool and great,Low power consumption. Built-it sensitive light sensor and vibration sensor, this cup mat will automatically turn on at dark when it feels vibration, and turn off after about 15s. 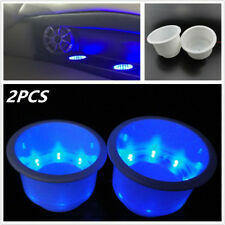 2PCS Plastic Cup Drink Holder With 8LED Blue Light Marine Boat Car Truck Camper. 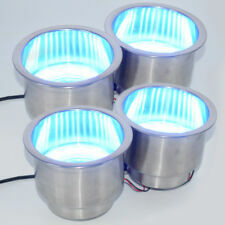 Blue Cup holder With 8LED. Depth of Cup: 3.15 ". 100% genuine products! We will try our best to reduce the risk of the custom duties. Material: Marine Grade Stainless Steel. LED specification: Blue 3V lights. We have warehouses in the USA, CA, and AU. Height overall including drain fitting : 3-1/4" (82mm). 2 PCS Universal Solar Cup Holder Bottom Pad LED Light Cover Trim Atmosphere Lamp For All cars All models. Solar Energy Cup Holder Bottom Pad LED Light Cover Trim For All cars All models. - Solar charging, pressing and vibration can be luminous. 2 x black drink holders. 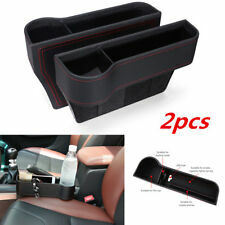 1Pcs Driver Copilot Co-driver Car Seat Crevice Storage Box Gap Filler Accessories. Material : PU Leather. Direct inserton,installation is simple and conwenient to fill the gap between. Elastic cup holder for enlarged capacity cup. Depth of Cup: 3.15 ". We have warehouses in the USA, CA, and AU. Rotary Laser Lever. 2 PCS Universal Solar Cup Holder Bottom Pad LED Light Cover Trim Atmosphere Lamp For All cars All models. - Solar charging, pressing and vibration can be luminous. 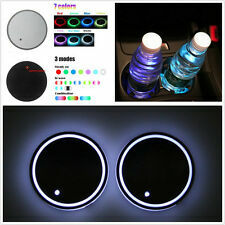 - 2PCS LED CAR CUP HOLDER. - After receipt the goods ,u need pressing the back button for 5 seconds to open the cup pad. Solar charging, pressing and vibration can be luminous. 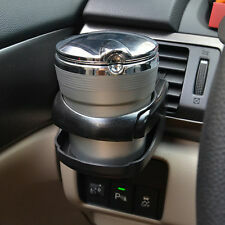 - 2PCS LED CAR CUP HOLDER. - After receipt the goods ,u need pressing the back button for 5 seconds to open the cup pad. - Light Color:Red Light. 2PCS Black Plastic/ Nylon Cup Drink Can Holder Boat Marine Boat RV Universal. Boat Cup Holder. Boat Rod Holder. Boat Ladder. Boat Light. Depth of Cup: 3.15 ". Cash is accepted, but only upon local pick-up. To keep pressing the switch for 5-8 seconds, the LED light will turn on, then the item will keep the light source when there are vibrations generated by start or run of the car. If the vibrations stopped, the product will automatically shut down in 15 seconds after the stay. Can be used as a Car Restaurant table or a Car Drink Holder during the travelling. 360-degree swivel design locks in place. 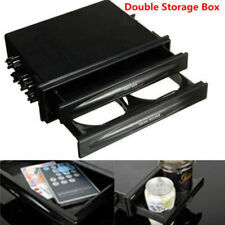 The car multifunctional tray is found that it is easy install and use. Attaches to a standard cup holder. 1x Pair of LED Car Cup Holder ( with ALFA logo). Installation Position: Cup groove. The product contains a vibration-sensitive device. When the car is shut off and the driver leaves, the light will stay on for 20 seconds and then enter the standby mode. Auto Car Swivel Mount Holder Travel Drink Cup Coffee Table Stand Food Tray Black. 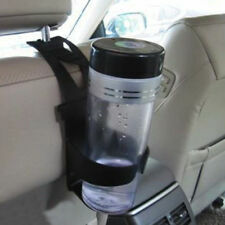 Can be used as a Car Restaurant table or a Car Drink Holder during the travelling. The car multifunctional tray is found that it is easy install and use. Universal 2x Hot Sale 304 Stainless Steel Boat Ring Cup Drink Holder For Marine Yacht Truck RV Car Trailer Hardware. Material: Marine Grade Stainless Steel. Depth of Cup: 3.15 ". Detail image. We have warehouses in the USA, CA, and AU. New Universal Air Outlet Drink Holder Magic Cube Cup Holder Car Phone Holder Multifunctional Sundries Holder for Vehicle Car Truck. 1x Cup holder. Universal car vehicle car bottle holder stand. It can be installed on the car door, window and the back of the chair with a hook. Car Rear Back Seat Table Drink Food Cup Tray Holder Table Desk Stand Mount. 1 x Car Drink Tray Holder. Cup drink bottle holder, pen coin paper purse gadgets organizer. Can be used as a car restaurant table or a car drink holder during the travelling. 2pcs LED Plastic Cup Drink Holder With 8LED Blue Light. Blue Cup holder With 8LED. Boat Cup Holder. Depth of Cup: 3.15 ". Boat Wheel. 4 Step Boat Ladder. We'd like to settle any problem in a friendly manner. 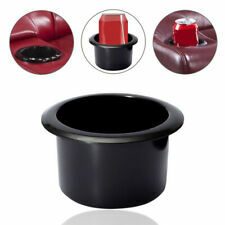 Suitable for Boat RV Sectional Couch Recliner Sofa Furniture Poker Table. 1 x Cup Holder. Material: Plastic. Function: Drink-Cup Holder Storage Box. 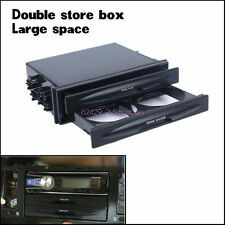 Modified type: When you modified single-disc machine when your car is double position, following a vacancy unsightly installation of this product, practical and beautiful! 2PCS 2.8" 72MM Silicone Car Logo Cup Holder Travel Auto Insert Coaster Can. Colorful auto logo design ,can used for drink coaster and anywhere also. • 2PCS Silicone Car Logo Cup Holder. Made of High Quality Silicone Material. Universal 2x Hot Sale 304 Stainless Steel Boat Ring Cup Drink Holder For Marine Yacht Truck RV Car Trailer Hardware. Material: Marine Grade Stainless Steel. 2x Carbon Fiber Style Car Front Bumper Lip Diffuser Splitters Anti-scratch Strip. Creative car cup mat with decorative White LED, makes your car cup holder looks cool and great. Built-it sensitive light sensor and vibration sensor, this cup mat will automatically turn on at dark when it feels vibration, and turn off after about 15s. The minimum width is 1.75" and the maximum width is 3.75". The ability to customize the size makes this compatible with virtually any cell phone. Insert the base into your car's cup holder. Turn dial and the base will gradually expand - this ensures the base will be ultra secure and not rattle around. Universal 2x Hot Sale 304 Stainless Steel Boat Ring Cup Drink Holder For Marine Yacht Truck RV Car Trailer Hardware. Material: Marine Grade Stainless Steel. We will reply you within 24- 48 hours. Due to light and screen difference, the item's color may be slightly different from the pictures. Depth of Cup: 3.15 ". Features: There 5 parts of this cup holder: top layer is for phone and sunglasses rack, 2 layers for beverage, 1 small box for beverage and small accessory like keys and the bottom for storage the coins. 360ºrotation make it easier to storage and increase more space to hold drinks or other items. It expandable into 4 holders for mugs or mount for keep drinks, phones, parking cards etc at your fingertips. Easy to assemble with soft silicone cup body cover which keeps your drink stable while you are driving. It can be placed drink cups which diameter is not more than 7cm/2.74 inches. Save more space for your little stuffs and your car becomes tidy and clean with this multifunctional cup holder..
High performance, Drink-Cup Holder and Storage Box combined into one. We are glad to serve you! Have a 1 to 5 year warranty program. Not refurbished, factory seconds, or replica products. Original manufacturer's serial numbers intact. Item Color Carbon fiber pattern. Multifunctional car storage box with big space: For phone, sunglasses, pen, holder for beverages, small stuff such as keys, coins, etc. 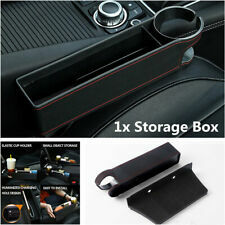 Type Multifunctional Car Storage Box. 2 x black drink holders. You may also like. Blue Cup holder With 8LED. Depth of Cup: 3.15 ". Our main categories include Marine Series, Outdoor Series, Also Automotive Series. Our products are made with the highest quality standards, You will find excellent new designs in every product range at very competitive prices. 1 x Double Din Radio for pocket. Function: Drink-Cup Holder Storage Box. - High performance, Drink-Cup Holder and Storage Box combined into one. Item Colour: Black. Solar charging, pressing and vibration can be luminous. - 2PCS LED CAR CUP HOLDER. - After receipt the goods ,u need pressing the back button for 5 seconds to open the cup pad. - Light Color:Blue Light. 4 PCS Arrival White Boat Plastic Cup Drink Can Holder Boat Marine RV Universal. Boat Cup Holder. Boat Rod Holder. Boat Ladder. Boat Light. Depth of Cup: 3.15 ". The Car Light. Cash is accepted, but only upon local pick-up.